A fresh new look to the original Baby's First Blocks with our Signature Style ownable look. Baby'sFirst Blocks comes with 5 shapes to sort with a total of 10 colorful shaped blocks. 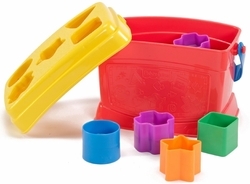 The sturdy,storage bucket with shape-sorting lid has a handle for on-the-go fun. Blocks included are two eachof cylinder, star, triangle, cube and plus sign. Baby's First Blocks also has a colorful label on the front of bucket introducing the friendly Signature Style characters as well as Signature Style molded detail on the back of the bucket!